Today is a day to go out and watch Catalina. 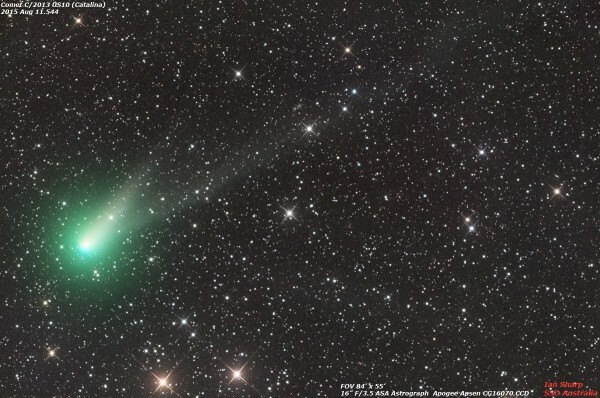 Catalina is a wandering comet, left Ort Cloud that will be visible to the naked eye today (about 12 pm GMT + 1), but with binoculars series able to see the double tail of the comet. A 110thousand km (just over 3 times the distance from Earth to the Moon), this comet passed but never again because its orbit will take out of our solar system. The classification of this star is C / 2013 and will be visible US10 east to about 10 degrees altitude just stuck Arthur (star Arcturus), near the Big Dipper (that if the know). Remember, though, that the green color of their tails is due to gas bicarbono it have.